Will Liverman (Dizzy Gillespie) and Lawrence Brownlee (Charlie Parker) perform a piece from the opera, “Charlie Parker’s YARDBIRD,” during a reception at the Apollo Theater following the Charlie Parker induction ceremony. The famed saxophonist was inducted into the Apollo's Walk of Fame two days before tonight's New York premiere of the opera about his life. LAWRENCE Brownlee is infatuated with his latest role. Perhaps Apollo Theater audiences tonight and Sunday (3 April) afternoon will be, too. “Going into jazz and learning about the freedom of the jazz performance has been fun for me. 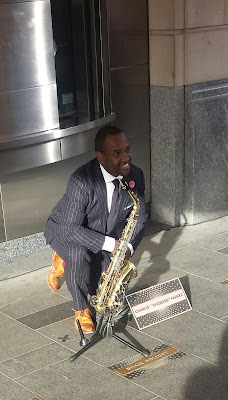 So I have enjoyed it,” he discloses during a VIP reception following the induction of Charlie Parker into the Apollo Walk of Fame. Opera Philadelphia President and General Manager David B. Devan, tenor Lawrence Brownlee and Apollo Theater President & CEO Jonelle Procope pose with the Charlie Parker plaque outside the Apollo Theater. Photos by V.W. “It’s been a great learning experience that I can even take elements of what I’ve learned in my studies and take it over to classical music, as far as the flexibility of the instrument and the voice." The tenor is recalling his experiences portraying the famed saxophonist and composer in an opera based on his life. 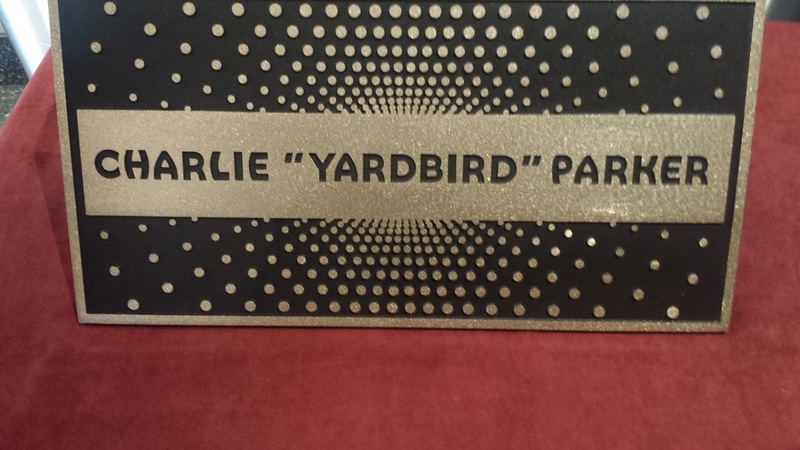 “Charlie Parker’s YARDBIRD” has its New York premiere tonight (at 8) at the Apollo, a venue that has history with CP. The opera had its world premiere last year at Opera Philadelphia and is now on the road. “Charlie Parker’s YARDBIRD,” a co-production of Opera Philadelphia and the Apollo, also builds on the history of the latter organization. It is the first time an opera will be performed on its hallowed stages. As it continues its mission to make itself even greater than it was in its heyday, the Apollo misses few opportunities to cross-market. On Wednesday, it inducted Kansas City native, CP, into its Walk of Fame. Among those in attendance was Jimmy Heath, who played with the man. A legend himself, JH waxed poetic in his remarks: Bird is the word / The music we all heard/ He made it clear / And his spirit is still here. The musician-composer also performed a little CP during the reception. 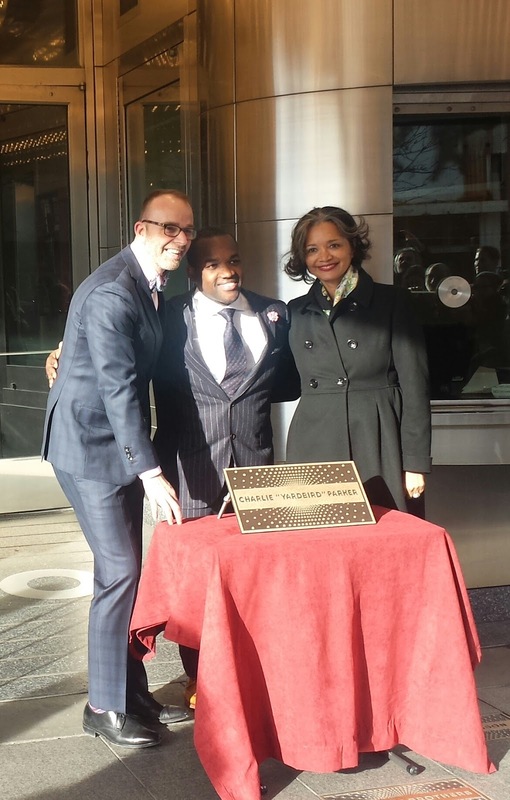 The plaque bearing the name of Charlie Parker will soon be placed outside the Apollo Theater on the Walk of Fame. “Charlie Parker’s YARDBIRD” is a part of that legacy and a role composer Daniel Schnyder (libretto by Bridgette A. Wimberly) conceived with LB in mind. Yes, it has been fun but not without certain difficulties. Unlike singers who stay in a “nice and neat two-octave range,” LB says, jazz musicians work at the margins, the extremes. “In this, I am challenged because I have to sing at the very top of my range and at the very bottom of my range … Finding colors. Finding shade. Phrasing. Punctuation in a very healthy, technical way,” he explains. If one puts any stock in reviews, LB has no issues with fluidity. In fact, even the harshest critics of “Charlie Parker’s YARDBIRD” have not taken issue with the singing of LB, Will Liverman (Dizzy Gillespie) and others in the cast. Tenor Lawrence Brownlee poses with a Charlie Parker saxophone and Walk of Fame plaque outside the Apollo Theater. This is a good omen for a traveling production. Next year, Chicago. Who’s to say where after New York. A star in the opera world, LB says prior engagements will prevent him from reprising his role at every stop. He is committed, however, to traveling with “Charlie Parker’s YARDBIRD” when possible. 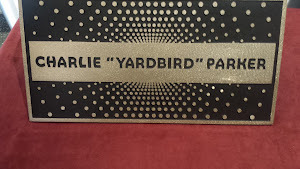 Visit https://www.apollotheater.org to learn more about “Charlie Parker’s YARDBIRD” and the Charlie Parker Walk of Fame induction ceremony.